Market Beginning to Shift? Or Maybe not? 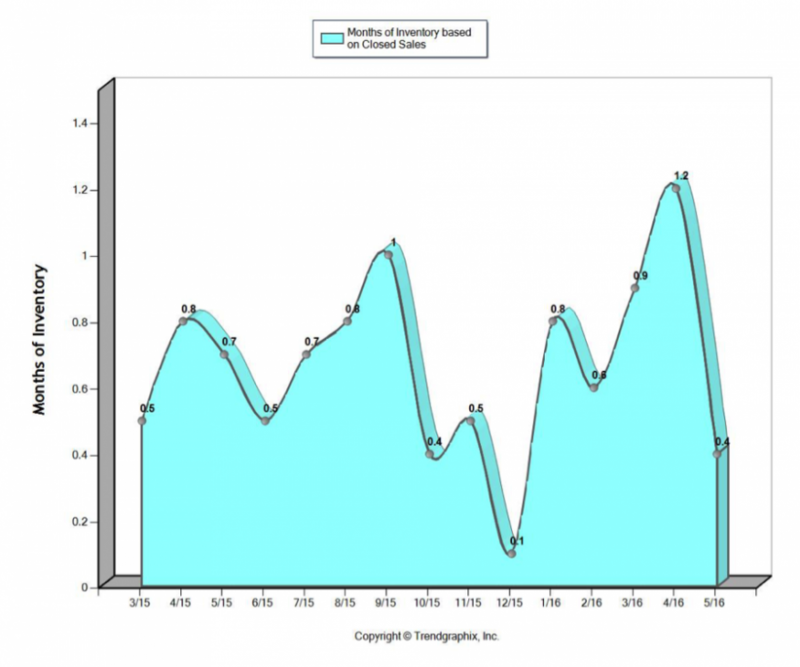 We have been noticing a slight shift in the market a few weeks ago. Higher priced listings around the million dollar mark are beginning to be on the market a bit longer and offer review dates often pass without offers being received. Looking more globally, this phenomenon is more pronounced in neighborhoods that are further out or in areas where schools are not as highly rated such as the Matthews Beach and Cedar Park areas but also evident in our own neighborhood. The statistics provided in this post are hyper-local, capturing only Green Lake and Tangletown as outlined in the map above. The numbers are for single family homes including townhomes. We captured all closed sales for April and May, both for 2015 and 2016. The number of closed sales has increased by 42.3% from 26 closed sales in 2015 to 37 closed sales in 2016. At the same time, the number of pending sales (transactions under contract waiting to close) was at 29 on June 1 which indicates an increasing rate of sales compared to the previous months. While average days on market has remained about the same year over year, it has gone up a bit from 9 days to 10.4 days. Also, the 9 active listings as of June 1st, show 24 days as average days on market with an average list price of $925,000. This is another indication of the trend mentioned in the introduction that higher priced homes take a bit longer to sell. The median sales price has increased by 10.5% year over year, so we are still experiencing double digit appreciation and the median sales price in the neighborhood for those two months was a whopping $800,000 (!). Maybe no surprise when considering that the Seattle region is now among the ten fastest-growing markets when it comes to seven-figure home sales and that the number of million-dollar homes has tripled over the last 4 years. The previous linked article contains an animated map that shows that Green Lake is certainly part of this growing trend in the region. 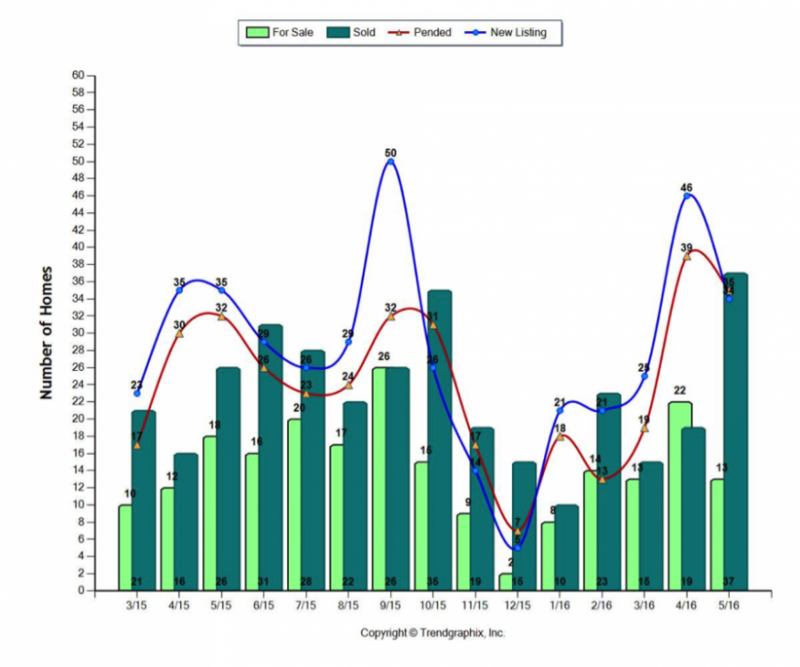 The following charts capture Green Lake (area as defined by NWMLS data) real estate trends for 2015 and 2016. This bar graph tells us how many homes were available for sale (light green), how many went under contract (red line), how many sales closed each month (dark green), and how many new listings there were (blue). We can definitely see an upward surge of listings in April and May of 2016 compared to the previous year. However, the graph also shows that the buying activity (red line) kept pace with new listings (blue line) coming on the market. 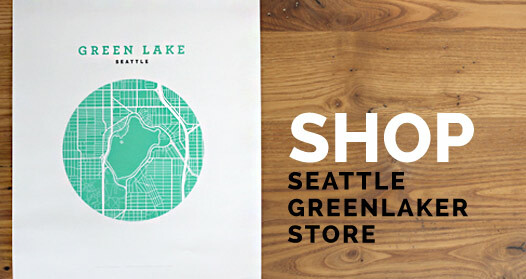 So Green Lake remains very strong even in the face of increasing inventory. In the chart below, the line at the top represents the relationship between sales and original list price. In March and May, the average sales prices soared 11% over list price. However, in April this average was at only 3% over list price. April was the month where we experienced a surge in housing inventory in our neighborhood. Generally, in our neighborhood of diverse housing we don’t put that much stock into price per square foot. The reason for this is that condition and finishes vary widely, and often agents list unfinished space as finished so the price per sqft is often not a very reliable measure. 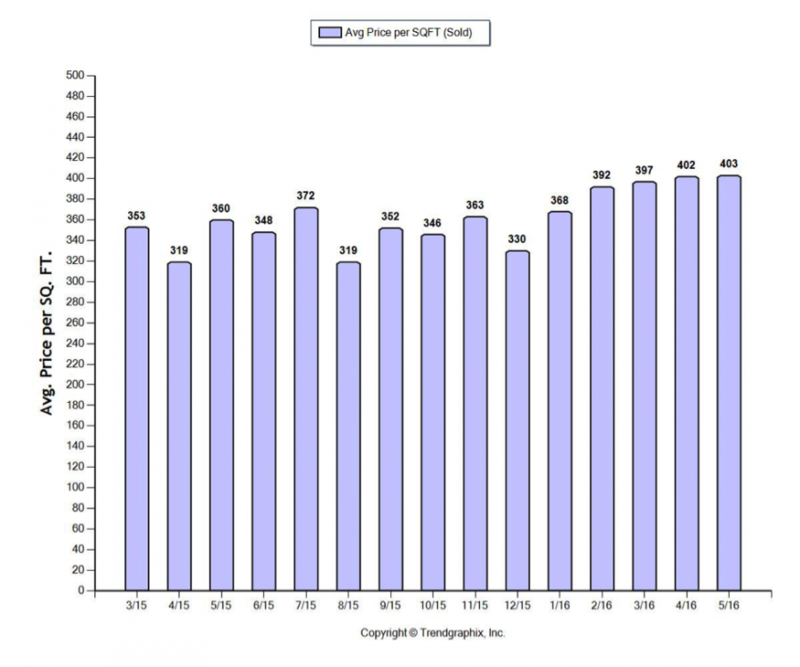 However, this chart shows price per square foot going up for the last 5 months, surpassing $400 per square foot in April and May of this year. Finally, this chart illustrates months of inventory. It is derived based on a calculation dividing the number of active homes for sale by the number of homes that have closed in a given month and attempts to project how many months it will take for the entire available inventory to sell. Anything under 2 months of inventory represents a sellers’ market. You can see that for the last 15 months, inventory was almost always under 1 month, and May was at 0.4 months. 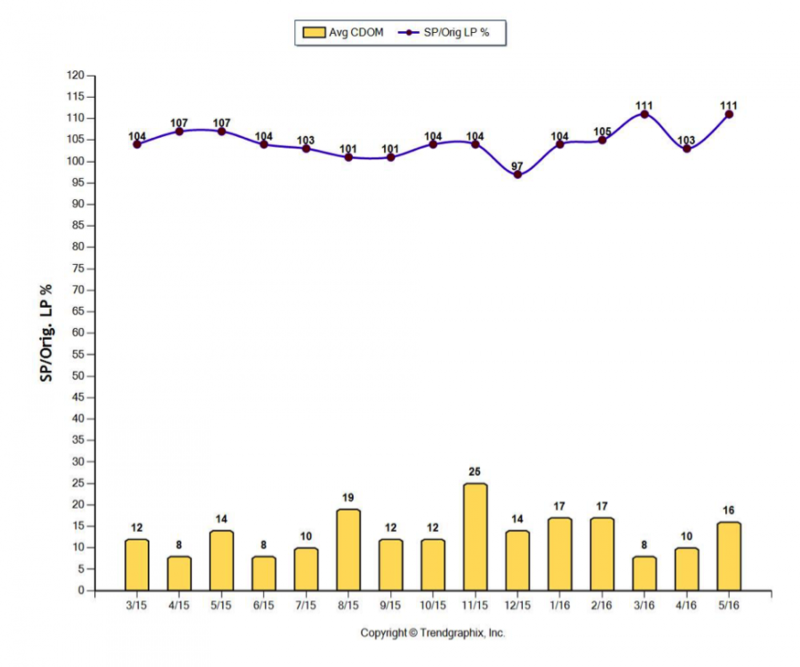 So the April surge of 1.2 month sold off quickly. If you are a move-up buyer or downsizer who has been staying put because there has been no housing inventory to buy, this could be your lucky break. If you are a seller, the market is still hot for most price points, but we did see a slight shift in April and May. Is this just a seasonal blip? Or part of an ongoing trend? Only time will tell.